Das Wort „Impeachment“ – zu Deutsch: Amtsenthebungsverfahren – fällt immer mal wieder in Verbindung mit Präsident Trump. Wie funktioniert „Impeachment“ eigentlich? Although many think that impeachment means removing the president from office, it is actually just the first step in a two-step process. If the House of Representatives thinks there has been serious misconductFehlverhaltenmisconduct, they can write articles of impeachment that describe it and vote on whether or not to impeach. If a majority of the 435 members votes in favor, the case then goes to the Senate for trialGerichtsverfahren, Prozesstrial, with certain House members acting as prosecutorAnkläger(in)prosecutors and the Supreme Court’s chief justiceVorsitzende(r) Richter(in) des Obersten GerichtshofsSupreme Court’s chief justice serving as the judgeRichter(in)judge. A two-thirds majority of the 100 senators is required for convictionÜberführung, Verurteilungconviction. If convicted, the president has no appeal processBerufungsverfahrenappeal process and is immediately removed from office. No US president has ever been removed from office by this process. Although two presidents were impeached — Andrew Johnson in 1868 and Bill Clinton in 1998 — neither was convicted by the Senate, and both remained in office. Articles of impeachment were introduced against President Richard Nixon in 1974, but he left the job before the House could vote on whether to impeach or not. The impeachment clause in the Constitution is somewhat vague, allowing the House and Senate to interpret what actions would be grounds for it. This interpretation has changed significantly over the years. For example, President Andrew Johnson was impeached for illegally removing a high government official from office and for his “inflammatoryaufrührerisch, aufhetzerischinflammatory and scandalous harangueTiradeharangues” against certain congressmen, among other things. Today, the president can fire any member of his cabinet without fear of impeachment, and his inflammatory tirades against congressmen and others occur regularly. If the impeachment process is introduced against our current president, it is far more likely to be along the lines of those for Bill Clinton: perjuryMeineidperjury and obstructionBehinderungobstruction of justice. There is a second path to removing a president. Under the 25th amendment (US)ZusatzartikelAmendment to the Constitution, which was adopted in 1967, the vice president and a majority of Cabinet officials or “such other body as Congress may by law provide” can declare that the president “is unable to to dischargeerfüllendischarge the powers and duties of his office.” This has never been used. Of course, there is one more path to removing a president from office. The people can simply vote him out in the next election. For that, we will need to wait until 2020. 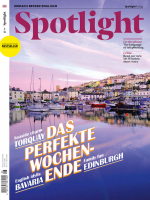 Dieser Beitrag stammt aus dem Spotlight-Magazin 6/2018. Die gesamte Ausgabe können Sie in unserem Shop kaufen. Natürlich gibt es das Magazin auch bequem und günstig im Abo.